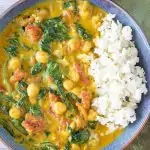 A satisfying and flavorful vegan curry dish, ready in less than 30 minutes! Using sauté setting – add oil, onions, and 1/4 teaspoon of salt and cook for about 3 minutes, until onions are soft and translucent. Then add ginger and continue cooking for another 3 minutes or so. Next, add garlic and cook for one minute more. Now Add curry powder and mix well, allowing to toast for about a minute. Stir in tomatoes, followed by chickpeas, coconut milk, and remaining salt. Mix well. Lock lid and cook at high pressure for 5 minutes. Once cook time is complete, quick-release pressure. Finally, add spinach and mix until fully wilted. Serve with rice or quinoa.